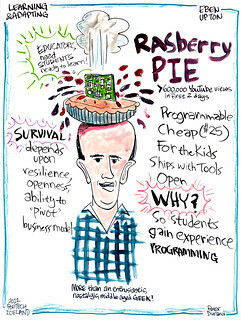 Eben Upton is a founder and trustee of the Raspberry Pi Foundation, and serves as its Executive Director. Computer technology teachers have a new teaching tool that has given students the foundation for a mass of invention and innovation. The Raspberry Pi — a circuit board the size of a credit card — has served as the starting point for computer science students to build an astonishing number of complex devices, learning the basics of programming in the process. And the cost for this incredibly small tech tool? Around $35USD. The small and economical computer was first developed by faculty members at the University of Cambridge in Britain who had noticed their incoming computer science students were ill-prepared for a high-tech education. They decided to build an inexpensive device that students could learn from. The Raspberry Pi is an ultra-low cost, credit card-sized computer designed to fill a much-needed technological gap in communities that cannot afford more traditional computing hardware and to provide children around the world the opportunity to learn programming.